Spices; cumin, sea salt, cayenne. Versatile, soul warming dish that can be made vegan or loaded with ground meat of your choice. Lean ground turkey is a healthy option. 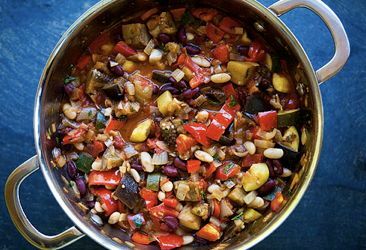 Place all beans in a large stovetop pot, cover with at least four inches of water. Bring to a boil and reduce to simmer for 45 minutes or until beans are nearly tender. Add all veggies and additional spices to taste. Cook until veggies are to your liking. May be topped with sour cream, fresh cilantro, or avocado.